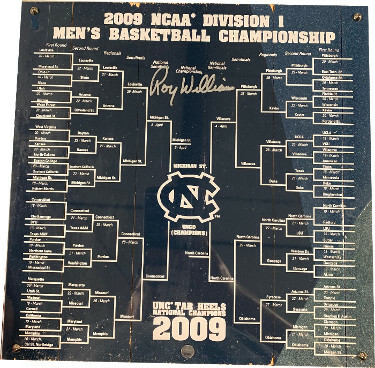 This Final Four/National Championship 12x12 Engraved Bracket in blue is signed by UNC Men's Head Basketball Coach Roy Williams. This piece is the actual hardwood floor/court from the 2009 Final Four. Williams has been the Head Coach of the Tar Heels since 2003, and has since won three NCAA Division 1 Tournament Championships. He has a career coaching record of 816-216. He was inducted into the College Basketball Hall of Fame in 2006 and the Basketball Hall of Fame in 2007. Steiner Sports Hologram and Certificate of Authenticity. Floor as shown, with minor game used wear/floor chips, sold as is, no returns.